Lizzie*Kate has a chart about housekeeping can kill you. Lucky you didn't break anything. I do so enjoy your blog. Very sorry to read about your health problems. I'm just recovering after a great adventure. Stitching sure helped keep me sane. Go carefully. Maria S.
OUCH! But, look on the bright-side, you can use the bruised leg as an excuse to stitch all day! Feel better soon! stitch away... Onward with healing and recovery. So sorry. Hope you heal rapidly. Ohhhhh noooooo! (Mr. Bill voice) take care of yourself, Coni! Oh dear! Elevate that leg & rest. Probably shook you up real bad! I'm so sorry! BTY, I'm not collecting the $3 I overpaid you for the needleminders so it will be coming back at you. Please put it in the kidney fund. Please take care of you for all of us!!! 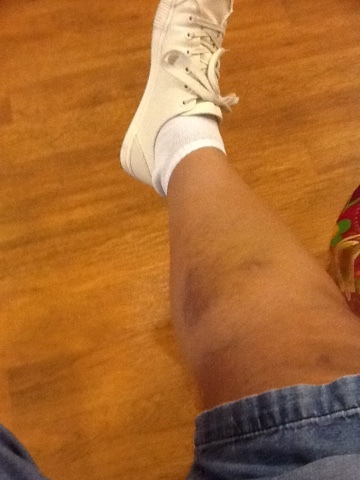 Oh Coni, I bet the Beepy and Bumpy bruises are jealous! Owwww. Take this weekend to rest and stitch. Oh my goodness Coni! Good reason to put your feet up and stitch the day away!